The 1st International rule, the R-rule of 1907, had come about as a compromise between the Scandinavian/German and the British. The Rule consisted of the same elements as the Copenhagen rule however the factors were altered favouring narrow and V-shaped hulls with large sail-areas, and less cruiser friendly. The designers agreed that this development was not sound and called for changes in the rule. Due to WWI (1914 – 1918) no meeting could take place in I.Y.R.U in London to discuss the matter. Denmark, Sweden and Norway, established Scandinavian Sailing federation (SSF) in 1915. One main priority for SSF was to suggest a revision to the rating rule, and a committee was set up with representatives from all three Scandinavian countries, the father of the International R-rule of 1907 Alfred Benzon from Denmark, the father of the Swedish “Square Metre Rule” of 1908 Karl Ljungberg from Sweden, and Johan Anker from Norway. See also Rules History sections: S-rule of 1902(1903), R-rule of 1907, S-rule of 1917 and Snarken History part I and part II. Since the late 1800 Norwegian sailors had been competing in international waters as in Sweden (Gothenburg, Malmö,Stockholm), Denmark (Copenhagen, Öresund), Britain (Cowes) and Germany (Kiel). In the international regatta in Gothenburg 1871, fitheen (15) of the more than 140 participating yachts were from the Oslo fjord area. Class rating was yacht-ton. In 1879 Gunnar Knudsen, Oslo, won 1st prize in a regatta in Malmö with his yacht “Peer Gynt”. The same year “Stjernen” and some other Norwegian yachts participated in a regatta in Copenhagen. However already in 1866 yachts carrying Norwegian, British and Swedish flags had participated in a regatta at Aarhus, Denmark. In 1880 one Swedish yacht, four Danish yachts and one British yacht participated in a regatta in the Oslo fjord. The Norwegian “Aljuca” participated in 1882 in Copenhagen as well as K.S.S.S. 50 year anniversary regatta in Stockholm. In 1884 "Aljuca" participated in Norddeutsche Regatta Verein races in Kiel. From the mid 1880-ties Norwegian yachts on a regular basis participated in regattas in Copenhagen, Gothenburg and Kiel. In 1886 Swedish, Danish and German sailors were invited to a regatta outside Arendal in southern Norway however only one German yacht was present not racing. In 1888 “Fulvia” from Malmö participated in races outside Hankö, Norway. In 1889 the “Girth rule” T= LxGx(L+G)/135 was officially adapted for measurement of racing yachts in Norway. The rules outcome was yacht-ton including length and girth measurements, and was mainly a volume, a displacement rule. In 1890 Gunnar Knudsen’s “Terje Viken won 1st prize in Copenhagen. 12 Norwegian yachts participated in K.D.Y.’s 25th anniversary regatta 1891 in Copenhagen. In 1894 Benzons “Girth – sail area rule” from the first conference in Copenhagen 1893 was endorsed in Norway, in addition to the "Girth rule". Two Norwegian yachts, “Storegut” designed by Colin Archer owned by Fred Olsen and “Nor” owned by sailmaker Nilsen, participated in Kiel 1895 under the opening of the Kieler Channel. In 1896 five Norwegian yachts participates in G.K.S.S. regatta in Gothenburg and Marstrand of which some come from races in Øresund. Two Swedish yachts participated that year in regatta outside Moss in the Oslo fjord. K.S.S.S. arranged in 1897 King Oscar II’s 25 years anniversary regatta in Sandhamn with participants from Swedish, Norwegian, Danish, Finish and German yacht clubs. The two Norwegian yachts, of which both were fitted out with bulb and fin keel were transported by train to Stockholm for the races. One Danish and two Swedish yachts participated later that year in races held in Kragerø in southern Norway. In 1898 Scandinavian and German sailors met in Copenhagen. The result of this 2nd conference was the Copenhagen Racing Rule and the Copenhagen Cruising Rule (ref. Rules History, section S-rule of 1902). That year, 5 yachts from Stockholm (“Vikingen”, “Snøhvit”, “Carmen”, “Blenda”, “Esperanza”) and 12 yachts from Gothenburg raced in Norwegian waters together with some Danish yachts. Classes were divided in Racers and Cruisers. Norwegian yachts participated in races in Malmö, Sweden and Taarbek, Denmark. As the year before classes in 1899 were divided in Racers, Cruisers and Older yachts. To the races in Norway in 1900 it was decided that yachts laid down in 1899 and 1900 should compete with the same handicap as the largest yacht in each class (i.e. the winner in each class is the yacht first crossing the finishing line). Five Norwegian yachts participated that summer in K.D.Y.’s regatta in Öresund and from then on Norwegian sailors on a regular basis are present at the annual race week in Öresund. In 1901, 6 yachts from Gothenburg participated in races at “Narverød”, Oslofjord. Classes were divided in Racers and Cruisers. 4 Norwegian yachts participated in the race week in Öresund and 9 Norwegian yachts in the race week in Gothenburg. February 13th 1902 Royal Yachtclub Kristiania (K.Y.K.) agreed to Alfred Larsens idea of a common challenging cup to be raced for by the 3 Scandinavian yachtclubs K.D.Y. Denmark, G.K.S.S. Sweden and K.Y.K. Norway. Contacts were initiated with the intention of the first races to take place in 1903 at K.Y.K.’s 25years anniversary. 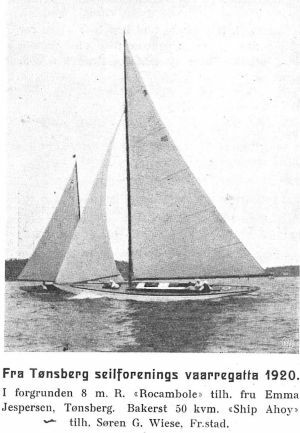 The cup to be called the “Kattegat cup” was to be raced for in the 9 Metre Class under the Copenhagen Cruising Rule of 1898 and without handicap. In 1907 races were moved to the International 8 Metre Class. In 1983 the cup was given from KNS to IEMA (International Eight Metre Association) to be raced for in the 8 Metre Class by older yachts laid down before 1960. The cup is today known as the “Sira Cup” after the Kattegat Cups last winner late King Olav V of Norway and his Eight Metre “Sira”. In 2008 IEMA World Cup races took place outside Hankö in the Oslofjord. King Harald V of Norway won the “Sira Cup” as helmsman onboard his late fathers 8mR “Sira”. 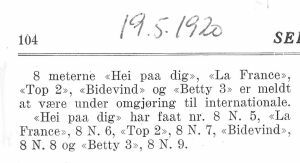 Articles for the Kattegat Cup of 1902 and the Copenhagen Cruising Rule of 1898 are included in Appendix: S-rule of 1902(1903). 6 Swedish yachts from Stockholm and Gothenburg raced in Norway in 1902. A third conference between Scandinavian and German sailors took place in Copenhagen in 1903 were it was agreed to abandon the Racing Rule of 1898 and only extend the Cruising Rule until 1907 which was the same time as the British rule expired. The Kattegat Cup races in 1903 are included under Rules History section S-rule of 1902(1903). K.Y.K. merges 1904 with K.N.S. (Royal Norwegian Yachtclub). In 1904 K.N.S. has listed 970 members and 328 yachts of which 585 members and 186 yachts resides out of Kristiania (Oslo) hereof 13 members and 2 yachts in Sweden, 10 members and 3 yachts in Britain, 7 members and 1 yacht in Denmark, 4 members and 1 yacht in France and 5 members and 3 yachts in Germany. In 1904 Norwegian yachts participated in the Öresund racing week and in Gothenburg. In 1905 Norway broke away from the union with Sweden and the relationship between Swedish and Norwegian sailors went sour. H.M.King Haakon VII succeeds H.M.King Oscar II as Protector of K.N.S. In 1906 meetings took place in London to agree upon the 1st international rule. The Scandinavian designers Benzon and Anker played an active part in the negotiations which result was a compromise between the Scandinavian/Germans and the British, ref Rules History, R-rule of 1907. The rule also called the “Metre Rule” was ratified by the European nations in 1907, and International Yacht Racing Union (I.Y.R.U.) was established with offices in London. Denmark with “Verana” won the Kattegat Cup races in 1903. Denmark won again in 1904 with “Paradox”, Sweden in 1905 with “Princess Margaret”, and Norway in 1906 with “Brand II”. In 1907 races was moved to the international 8mR Class. Winner that year was Norway with “Brand III” as the only competitor. W.F. Meyer from Bergen had in the 1890-ties been part of the Norwegian yacht fleet racing in Sweden and Denmark. 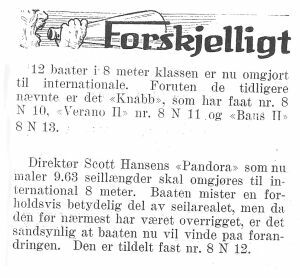 From 1907 on the number of sailors from Bergen participating in international regattas increased. Racing destinations were Gothenburg, Malmö, Copenhagen, Kiel, Cowes and Ostende. In 1908 the Swedish designer Ljungberg presented his “Square metre rule”. Sailors within K.S.S.S. were critical to the “Metre rule of 1907” which they felt would promote narrow V-shaped hulls with large sail areas, less friendly for cruising. In the London Olympics 1908 Scandinavia was in the 8mR Class represented with “Vinga”, Sweden and “Fram”, Norway. 10mR “Allegro” owned by Svensson, Malmö, Sweden participates in regatta in Kragerö and Tönsberg, Norway. 7mR “Sonja” owned by Christiansen, Kristiania (Oslo), participates in Öresund racing week. The relationship between Swedish and Norwegian sailors, which had suffered since 1905 started improving again in 1910. KNS was invited to participate in G.K.S.S. anniversary regatta in Gothenburg and a fleet of Norwegian yachts participated, hereof two 12mR, three 10mR, one 9mR, four 8mR and three 7mR. After the race week in Gothenburg several Swedish sailors joined their Norwegian friends to races at Hankö, Norway. No races for the Kattegat Cup had taken place in 1908 and 1909. In 1910 8mR "G.K.S.S." raced 8mR “Condor” from KNS. This year it was agreed to split the 6mR and 7mR classes in two, separate classes for open and closed yachts. Johan Anker races with 6mR “Ola”, KNS in Kiel. 12mR “Rollo” and 8mR “Taifun”, both constructed in 1911, participated with success in Kiel. “Rollo” went from Kiel to Cowes where she proved superior to the British 12 Meters. The Olympic races in 1912 were to be held in Nynäshamn outside Stockholm. Fourteen entries were made to the International R-Classes of which Sweden 14, Finland 6, Russia 6, France 4, Norway 4(3), Denmark 2 and Germany 1. 8mR “Lucie IV” from Norway was present but did not race. No British yachts participated in the 1912 Olympics in Stockholm. In Cowes 1913, 6mR “Mosquito” from Norway is the first Six Metre with Bermuda sail. “Mosquito”, 8mR “Taifun” and 10mR “Noreg” (ex “Magda 7) participates in the third European Race Week in Le Havre. As a result of strong consultations by KNS President Sam Eyde involving the King of Spain the fourth European Race Week in 1914 is to be arranged in Norway, and for Spain to follow in 1915, which never happened due to WWI. Sam Eyde travels to Kiel where he consults Keiser Wilhelm on next year representation in Norway. Johan Anker advocates in Britain for British yachtsmen to participate in the upcoming event. Celebration of the 100year anniversary of the Norwegian Constitution takes place in 1914 with European Racing Week in Horten in the Oslofjord. 132 participating yachts representing 8 nations, Denmark, UK, Finland, Netherlands, Russia, Sweden, Germany and Norway. 33 foreign yachts including 3 German schooners. Five 15mR, eleven 12mR, six 10mR, eleven 8mR and a large number of 6mR were competing in the International Classes. In 1914 Norway had in accordance with statistics from Lloyds the third larges fleet of nation built R-yachts in Europe, only outranked by Germany and France (Britain listed as number four). British 8mR “Ierne” is the first Eight Metre with Bermuda sail and the Norwegian 12mR “Symra” is the first twelve metre with Bermuda sail. The fourth European Racing Week at Horten proved to be the last one. From Oslo the yachts raced to Marstrand for the Gothenburg regatta. After Gothenburg, races are scheduled to take place in Copenhagen. The political situation in Europe is tense as the outbreak of WWI is only days ahead and the Copenhagen regatta is cancelled. In 1915 Scandinavia Sailing Federation (SSF) was established with representatives from Denmark, Norway and Sweden. All designers agreed that the development of yachts was going in the wrong direction. Due to the war no meeting could be called for in I.Y.R.U. in order to discuss modifications to the Metre Rule. As such one main activity for SSF was to suggest a revision of the international R-rule of 1907. The initial discussion in 1915-1916 included replacing the international formula with a new formula to be temporary in force until the international formula expired on Dec. 31st 1917. A new formula with less influence from hull factors beam B, girth G and girth difference “d”, more in line with the American “Universal rule”. The first meeting in SSF was to be held in Stockholm on February 5th-7th 1916 and revision of the R-rule was up for discussion. Prior to the meeting SSF had in writing informed the sailing nations in Europe that they intended to arrange a common conference after the War. Rumours said that German sailors were invited to participate at SSF’s meeting in Stockholm, which was badly received among British yachtsmen. The Yachting World (Y.W.) announced in an article that Scandinavian was withdrawing from international cooperation. However although few British yachts were participating in races in Scandinavian Y.W. agreed to the benefit a common international rule had on second hand sales of British yachts. During WWI several British and German yachts were sold to Norway who at the time had the largest fleet of R-yachts in Europe. Famous yachts as 15mR “Istria”, “Maudrey”, “Pamela” “Tuiga”, “Hispania”, “Lady Anne”, “Isabel Alexandra”, and 12mR “Javotte”, “Ierne”, “Cintra”, and 8mR “Garraveen”, “Ierne”, “The Truant”, and several 7mR and 6mR got Norwegian owners. Nevertheless Y.W. suggests that Britain after the War enters into a separate racing union with France, Belgium, Russia, Spain and one or two more nations. Finnish designers advocated for the American “Universal Rule” to become the new international rule as not only USA but also Russia and Finland had adopted the rule. The formula presented by SSF based upon Johan Ankers thoughts during the February 1916 meeting was strongly supported by Finland’s Gustav Estlander residing in Sweden. The formula he expresses to be the coming International Rule. He concludes the formula will result in seaworthy and cruising friendly yachts in between Finlands existing “American” and “International” yachts, and that existing yachts with minor modifications could be modified to fit into the new classes. For details go to Rules History section S-rule of 1917. SSF’s attempt of replacing the international formula with a new formula to be accepted as international after the War was certainly not going to be an easy task. The war in Europe had affected racing between the Scandinavian countries. This picked up again in 1916. A fleet of Norwegian yachts participate in regatta in Gothenburg and Copenhagen. K.D.Y celebrates her 50 year anniversary with 3 Norwegian 12mR on the starting line. 2 Swedish yachts participate in KNS regatta outside Kragerö in southern Norway. Sweden wins the Kattegat Cup races in 1915 with 8mR “Tuttan”and in 1916 with 8mR “Angelica”. In 1917 the cup returns to Norway by 8mR “Quinta” (Anker 1914). “Quinta” which the last years had been under Danish ownership was fitted out with new Bermuda sail plan, same as her competitors “Tuttan” of Sweden and “EA 2” of Denmark. The international R-rule expires 31st December 1917 and Johan Anker running one of Europes largest yacht construction yards in Vollen outside Oslo is determined to keep up design and construction work. Benzon, Ljungberg and Anker had continued their work on a revision to the R-rule and on a meeting in Copenhagen in October 1917, SSF settles for a modification to the International formula to be valid from 1st January 1918 and for a period of 5 years. The revised formula to be known as the Scandinavian S-rule of 1917 contained no beam “B”. The impact of girth difference “d” in the formula was weakened as well as sail area. The size of the S-1917 rule yachts was compatible with the R-1907 rule yachts, keeping construction cost down. For details go to Rules History section S-rule of 1917. The Kattegat Cup races were moved to the 8mS Class. Winner in 1918 and 1919 was KNS, Norway with 8mS “Apache” sail racing no sH25. In 1916 yachts have been started given sail identification numbers. The 8mR (1907) Class was identified with letter “H”. SSF decided that the 8mS yachts should be identified with a half sized letter “s” added to the Class letter, i.e. “sH”. For racing between 8mR-yachts and 8mS-yachts SSF decided that R-yachts should give S-yachts a handicap of 12sec/nm in wind force less than 5m/sec. This due to the R (1907) yachts larger sail area. WWI ends in November 1918. 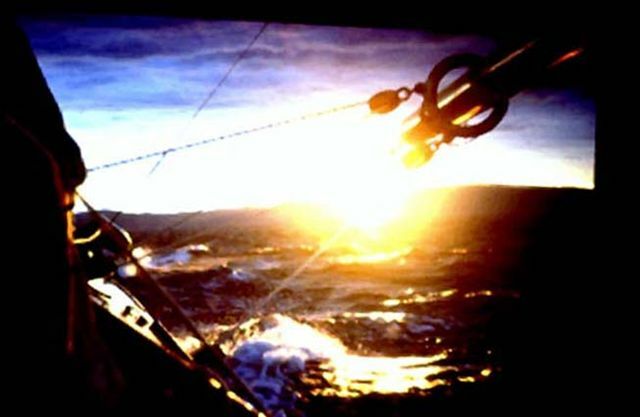 Scandinavian Sailing Federation (SSF) was in 1915 established with the purpose of coordinating yachting activities between Denmark, Norway and Sweden during wartime. SSF decides to make an attempt to get I.Y.R.U. back into operation. Johan Anker, president of SSF travels to London in order to get matters moving. Part of Johan Anker and SSF's objective is to get British acceptance for the S-rule to become the new international rule. However neither of the two presidents in I.Y.R.U. Sir William Burton and Sir Philip Hunloke nor I.Y.R.U. secretary general Major B. Heckstall-Smith shows interest in promoting a new international union. For some time it seems like British yachtsmen wants to go by themselves. The Prince of Wales is in January 1919 elected President of Y.R.A. During the January 24th meeting several sailors express that Britain should decide its own way and not pay attention to nations not participated in the War, and whatever experience they had earned during wartime. The British attitude causes a lot of uncertainty in regard to ongoing and future yacht design and construction. Anker & Jensen yard in Vollen had in early1919 several orders under construction including four 8mS yachts based upon Johan Ankers drawing of 27.09.1918, of which one (to day known as "Snarken") was ordered by engineer Arne Blakstad. Later one more 8mS was ordered based on this design to be known as "Trolljo III". Advised by Johan Anker, acting as president of KNS and serving as president of SSF, King Haakon VII of Norway sends a letter to King George in Britain. In meeting on March 27th 1919 it is decided to call previous members of I.Y.R.U. except Germany and its allies to an international conference in order to agree upon a new international rating rule. Based upon an invitation from SSF, Sir William Burton and Major B. Heckstall-Smith travels onboard one ship from the British Navy to Copenhagen and further to Stockholm before they end up in Oslo overlooking the 1919 spring regatta on June 14th –15th . In the races participated 92 yachts including five (5) Twelve Metres and twelve (12) Eight Meters. Of the Eight Metres 8 belonged to the 8mS(1917) Class and 4 to the 8mR(1907) Class. Burton and Heckstall-Smith were both impressed by the high standard of the sailors in handling their yachts and the yacht construction methods. 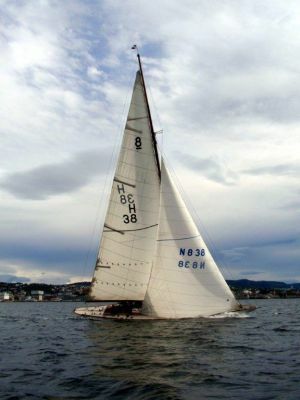 12mS "Heira 2" owned by Olaf Örvig, Bergen outclassed both days the other 12mS and 12mR yachts, including 12mR "Erna Signe" owned by Sam Bull who later in 1927-1929 was the owner of "Snarken", at the time named "Idyll III". In the 8mR Class, H17 "Ierne"(1914, design Fife) won the Saturdays race with overall best time 3.30.11. On Sunday H7 "Garraveen" (1914, design Giles) won with overall best time 2.13.37. The 8mS Class was both days won by sH25"Apache" (1918, design Anker 1917) with finishing times 3.30.39 and 2.16.13. Although the best 8mS yachts were not faster than the best 8mR yachts they proved their seaworthiness and cruising friendliness. Two of Ankers last 8mS designs of 27.09.1918 participated in the regatta, sH34 "Betty III" and sH37 "Koh-i-Noor, of which "Betty III" owned by Jac. Lindvig, Oslo came in third on Saturday with time elapsed 3.31.20 and second on Sunday, time 2.18.41. As such it seemed to be questionable if Johan Ankers 8mS design of 1918 was faster than his 8mS design of 1917, and sH25 "Apache" was again selected to represent KNS and Norway for the in 1919 upcoming races for the Kattegat cup. After visiting Oslo Sir William Burton and Major B. Heckstall-Smith travels to the USA. In a letter to Philippe Hunloke, Johan Anker strongly advocates for Britain to make a positive move in future cooperation with Scandinavia within international yachting. The alternative would be for SSF to go for a North European Yacht Union. A lot of uncertainty is related to Russia after the revolution in 1917. Hunloke acting as President of I.Y.R.U expresses his support for a renewal of the international yacht union, although he does not support international regattas in competition with racing in British waters. Hunloke’s support turns the attitude among British sailors in favour of renewing the union, and a conference to take place in London is called for by Y.R.A. in fall 1919 to discuss matters including revision of the international “Metre Rule”. The conference arranged by Y.R.A. in London in October 1919 gathered delegates from Argentina, Belgium, Britain, Denmark, Finland, France, Holland, Norway, Spain and Sweden. Germany was not invited. Y.R.A. had in meeting decided not to participate in any regatta with German entries for the next 10 years. (This decision was weakened as time passed by.) U.S.A. was present at the London conference with two observers. Among the representatives for Scandinavia were Johan Anker, Alfred Benzon, and director of DnV, J. Bruhn. There were two strong groups of opinion among the delegates, those who favoured a revision of the International R-rule of 1907, and those who favoured the American “Universal Rule” to become the new International Rule. Among the supporters for the “Universal Rule” were representatives from Britain, Holland, Belgium and Finland. The conference focused to start with on other matters approving 2 Swedish sqm-classes (30sqm and 40sqm), 2 French National classes (61/2 metre and 81/2 metre) and 2 British dinghy classes (18 feet and 12 feet) as International Classes. As to the main question, a compromise was brought forward of approving 4 Universal Rule Classes and 4 International R-rule Classes. Sir Philip Hunloke warned against a division of the International Classes and the International Rule won a close vote. It was a common understanding that from a seaworthy point of view the development in the recent years had gone in a more sound direction with less sail area on larger hulls. However, the hulls were still narrow and V-shaped. The most extreme 8 meters had a max beam B of 2.10 m or less. A negative effect was that construction cost escalated with the larger hulls. In Scandinavia the first modified R-rule, the S-rule of 1916 had not met the expectations. A further modification was made, and the Scandinavian S-rule of 1917 proved to overcome the V-shape, however although the yachts were wider and more like the first R-rule yachts in 1908, they were still narrow. Max beam B on Johan Anker 8mS, drawing date 29.11.1917 was 2.36 m and drawing date 27.09.1918 (yard no 220, 221, 223 Snarken, 225, 227) was 2.45m. Compared to the R rule of 1907 the measurement of “L” and “d” in the S rules differed. “L” was to be measured 1% of Class rating above floating level LWL with bow girth and stern girth representing a more effective waterline length. The impact of “d” was weakened. Skin and chain girth difference to be measured to a point on the hull defined by a tight chain of length 1/8G from LWL. The restrictions on measuring “G” were slightly changed. The hull size and construction cost were comparable to the early R (1907) designs with approximately the same L.W.L. around 8 metre plus for an Eight Metre. This was a to big step to take for the majority of delegates. Anker supported by Benzon argued for a revision of the R (1907) rule to be done in accordance with the modifications laid down in the S-rule. After a lengthy discussion on factors and restrictions a development of the S(1917) rule was agreed to. The new R formula contains the same elements as the S-rule of 1917. 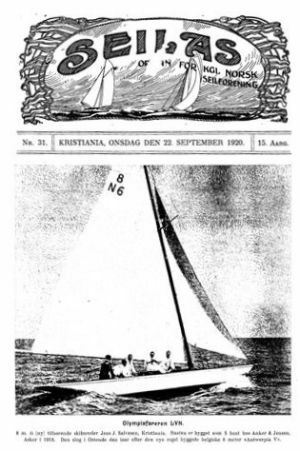 KNS yachting magazine “Seilas” of Oct. 29th 1919 reports that the S-rule is accepted as International. The changes are not greater than all existing S-yachts can be measured to the new formula with minor modifications if any. As in the S-rule beam B is left out of the formula, and increased penalty is put on sail area "S" although only 85% of the jib area is included. Measured waterline length "L" is to be taken 1.5% of the class rating above floating waterline compared to 1% above in the S-rule, with bow and stern girth. The measurement of girth “G” and girth difference “d” are further developed from the S-rule. Girth “G” is to be measured at the 55% point of L.W.L. Girth difference "d" is to be measured in the “G" frame section down to a point on the skin defined by a depth of 12,5% of the Class rating below L.W.L., i.e. one (1) meter on an Eight Metre. The impact of “d” in the formula is weakened compared to the R(1907) rule, but to a lesser extent than in the S(1917) -rule. Further a minimum displacement requirement was introduced not discriminating the S(1917) - rule yachts from being measured and classified under the new R-rule. The meeting in London decided to have Lloyds to develop scantlings for the new international R-classes to be presented and agreed upon in 1921. Until then the scantlings for the R-class of 1907 should be in force. Yachts certified to the new R-rule should have Class rating identification, country code and yacht racing number in their sails. Classes agreed upon were R = 6, 8, 10, 12, 15, 19 metre. The 7m and 9m classes were left out. The alterations agreed upon in London in October 1919 were in accordance with the ones made in the S-rule. The new international formula contained the same elements, beam B was left out of the formula, and increased penalty was put on sail area "S". So far the Scandinavians Anker and Benzon won a victory. The V-shape had in the S-rule been overcome by weakening “d” in the formula. And the increased penalty on sail area had brought the size of the yachts back to 1908. However from experience sail area on the S-yachts could preferably have been cut back more. Thus resulting in larger hulls to develop also under the S (1917) rule. Alternatively more penalty should have been put on sail area in the S-formula. As such the potential of neither the R(1907) rule nor the S(1917) rule was fully explored at the time when the 2nd International R-rule of 1919 was agreed upon. Both rules had proved their weaknesses and as such the new rule from a technical point of view was more than welcome. The difference in opinion between the groups of delegates was mainly a question of construction cost and defining Classes. The outcome had to be a compromise on several areas of which the British won the most. Opening up for increased length, height of freeboard and increased depth within the defined Classes, an Eight Metre tailor designed to the new formula would have the size of an early 9 Metre but not differ to much in look above water from the latest 8 Metres constructed in Britain before the War, except a wider beam. No limitation such as minimum displacement was agreed outruling the S-yachts from being measured and classified under the new international rule. Final impact on size and Classes were set by the division factor in the formula. The division factor in the R(1907) rule was 2.0 and in the S(1917) rule 2.1. The October conference in 1919 agreed upon a division factor for the new R(1919) rule of 2.5. An anticipated division factor of 2.3 would probably have met Johan Ankers wishes of keeping the same hull size and classes as the S-rule and construction cost down. 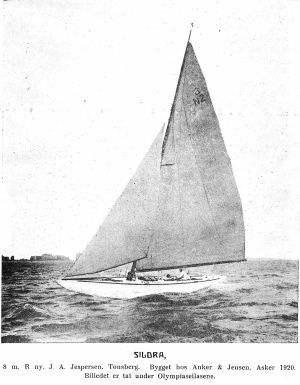 One main intention behind the first international R-rule of 1907 was to agree upon a “Non Restriction rule” where it was up to the designers to within the frames given by the formula to determine overall length, waterline length, beam, freeboard, depth, girth and girth difference, sail plan and sail area including height and weight of masts. However, as the designers developed more extreme yachts, restrictions were agreed affecting various elements in the formula, minimum displacement, max depth, min beam, max freeboard, max height of sails, diameter and weight of masts etc. Thus turning the International rule more into a “Restriction rule”. Freeboard on Ankers 8mS yachts was 0.75m compared to 0.85m on Ankers 8mR (new) “Sildra”. Max freeboard “F” in the R (1919) formula is restricted to (0.08 x R + 0.25 m) which for R=8 amounts to 0.89 m.
Max depth in the R (1919) rule is restricted to (16% x LWL + 0.5 metre), which for an Eight Metre with LWL of 9m is 1.94m. An increase in LWL would under the R (1919) rule allow deeper hulls. Measuring "G" at 55% of LWL without any link to max depth invites for extreme sloping keel as on 8N23 “Irene VI” designed by Bjarne Aas, Norway in 1926. In the S-rule max depth was linked to girth "G" such as (G + B) in no position aft should be larger than in the measurement position. The outcome was 8m yachts with depth around 1.70m, while in accordance with the R(1919) rule the same yacht with a L.W.L. of 8.25 metre was allowed a max depth of 1.82m, and a yacht with L.W.L. of 9.0 metre max depth could be (16% of 9.0 + 0.5) = 1.94 metre. Minimum displacement was also linked to L.W.L. and if the displacement of a yacht was less than required, 2 times the difference between the actual L.W.L. and the L.W.L. corresponding to the min displacement of the yacht should be added to "L" in the rating formula. Min displacement to be (0.2 x L.W.L + 0.15) in cubic, i.e. for a yacht with L.W.L of 8.25 metre min displacement without penalty should not be less than 5.832 ton and for a yacht with L.W.L. of 9.0 metre not less than 7.415 ton. The British yachtsmen favoured larger hulls in order to improve yacht seaworthiness for cruising in British waters. Thus they argued strongly for adding more planking above water. Anker argued for putting cabin top on the 8mR Class in order to meet cruising needs without escalating construction cost. The construction cost of the R-yachts did not relate to their second hand prize. As soon as a design was beaten by a new design the market prize dropped. In Norway the less costly 75m2 became most popular also for cruising, and top ranked among new built yachts in 1916. In the R-rule agreed upon in Oct. 1919 cabin top on Eight Metres was made voluntary. Later this became a permanent requirement as included in the amended R-rule articles of April 1928. Johan Ankers design for convertion of S-Eights to R(1919)-Eights and his new design 8N2 "Sildra", drawing date 19.01.1920 yard no 241 were on the drawing board fitted out with cabin tops, ref. Snarken history part I. However, "Sildra" was in the yard constructed without cabin top. sH33 "Rocambole" converted to 8N4 "Rocambole". She was ordered by Chas W. Scappel in fall 1918 given first name "Sans Souci" and sail no sH31. The contract was taken over by J.A.Jespersen, Tönsberg who named her "Rocambole" and gave her sail racing no sH33. She was launched in spring 1919 as the last 8mS yacht constructed in accordance with Johan Ankers drawing of 29.11.1917. When Johan Anker as result of the I.Y.R.U. October 1919 conference, converted his own sH22 "Brand V" to 8N1 "Brand V" with cabin top and adjusted sail plan, Jespersen together with Konow were the first to order conversion of their yachts to new international. Konow had won the Kattegat Cup for Norway in 1918 and 1919 with his sH25 "Apache" which was given the converted sail racing no 8N3. In 1920 J.A.Jespersen sold 8N4 "Rocambole" as he acquired Johan Ankers tailor made design 8N2 "Sildra", drawing dated 19.01.1920. Jespersen with "Sildra" become Gold medal in the 1920 Olympics with Konow as crewmember. 8mR (new) "Sildra" sail racing no. 8N2. Picture in Seilas taken during the 1920 Olympics. Early summer 1920 is twelve 8mS conversions reported in Seilas. In addition to "Brand V", "Apache" and "Rocambole" are "Hei paa dig" given new sail no 8N5, "La France" 8N6, "Top 2" 8N7, "Bidevind" 8N8, "Betty III" 8N9, "Knabb" 8N10, "Verano II"(Snarken) 8N11 and "Baus" 8N13. In addition the convertion of 9mR(old) "Pandora" to new international 8N12. More to come - 8mS "Sif" converted to 8N14, "Koh-i-Noor" converted to 8N15. 8mR(old) "Sans Atout" , 2nd in the Stockholm 1912 Olympics, was converted given sail racing no 8N16. The last one to be given new converted sail racing no was (A&J yard no 227) "Trolljo III" 8N17, the last of Johan Ankers 5 yachts constructed in accordance with drawing dated 27.09.1918, and who had been given the vacant sail no sH31. sH27 "La France" converted to 8N6 "Lyn"
The effect for Scandinavia and Anker was that the S-yachts although they measured in under the new R-rule would not be optimised to the formula compared to new designs to come. Johan Anker proved this himself in 1920 with 8mR “Sildra” who outclassed all the converted S-yachts and won gold medal in the 8mR(new) Class in the1920 Olympics. This resulted in that the converted 8mS-yachts in Norway in 1921 decided to return and race in their own S-Class as before. The 7m Class was not included as new International. In Scandinavia the rating rule suggested by Johan Anker in the London meeting as new international: R = (L + sqrtS – F)/k was agreed as the new 7mS rule with a division factor k=2.3. The same formula was made valid by I.Y.R.U. in 1926 for Classes above 12mR. This was partly reversed by I.Y.R.U. in 1928 -1929. Yachts rating 14.5mR and less shall be measured as 12mR and under. When the S-rule elapsed in 1922 it was decided to combine the R(1907) and S(1917) classes in one common class - "old class". SSF had earlier, in fall 1919 removed the initial agreed handcap between the R(1907) and S(1917) classes. The 6mR Class became most popular, however only a limited number of new R-yachts from Eight Metre and above were constructed. As to the new scantlings presented by Lloyds in 1921 they did not support stronger yachts. KNS advocated for scantlings not only to be related to reduced sail area but also to increased hull size, and as such they preferred the old R(1907) scantlings to be in force. A further revision of scantlings also involving Det Norske Veritas (DnV) was enforced in 1924, made applicable for yachts laid down in 1925 and onwards. There were many larger yachts around used for cruising, R(1907) -yachts, S-yachts, Sqm-yachts, yachts constructed under the Copenhagen Cruising rule and others. The discussion started how to get these yachts back to the race field and in 1926 the N.L. rule - i.e The Nordic Length Metre rule was agreed upon within Scandinavian Sailing Federation (SSF). - Go to Rules History: S(1926)-rule. Still the S-yachts on a lucky day could beat their new R competitors in lighter wind. However this favour diminished in 1926/27 with the inclusion of the Genoa jib without any increased penalty on sail area in the formula. This principle differed from the old R-rule and the S-rule with the intention of measuring 100% of sail area used for head wind. In the R (1919) rule only 85% of the jib area was included and the introduction of the Genoa without penalty favoured even more the use of large fore sails. Restrictions not included in October 1919 were agreed based upon gained experience with the new formula and ammended to the R(1919) rule articles during the coming years. Some major amendments took place: - Go to Rules History: R(1919) amendments April 1928.